Bookings will resume from 22nd March 2019. “The hall is a Parish facility primarily for use in conjunction with the Church and its services, including baptisms, weddings and funerals and that it is available for use by groups associated with the parish or for other purposes at the discretion of the Parish Priest. Furthermore, the hall is owned by the Diocesan Trust and can only be used for purposes which are consistent with the charitable objects of the Diocesan Trust. It is a condition of all hirings that the hall will not be used for any purpose which is contrary to the teachings of the Catholic Church or which could cause offence. At all times the Catholic nature of the hall must be respected. 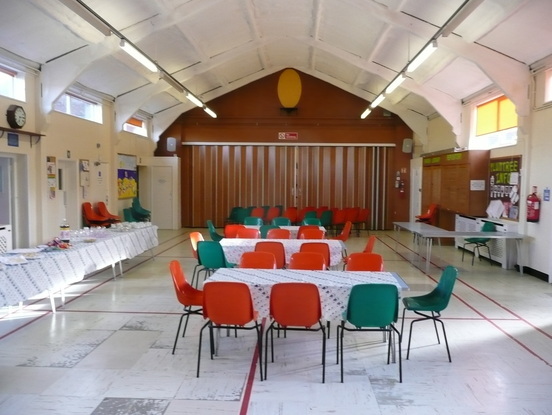 Any breach or potential breach of this condition will mean that the use of the hall is withdrawn.” Source: http://www.rcsouthwark.co.uk/media/Parish%20Financial%20Administration%20-%2017%20M092.pdf pg.20. If you would like to book St. Theresa's Hall please ring Ann on 01959 575916. The hall is complete with a small modern kitchenette, thus making it an ideal venue for all kinds of functions. The cost is £15.00 an hour.